has fashioned a diverse and sophisticated economy that ranges from advanced manufacturing to logistics to life sciences. Its unique cultural and recreation opportunities have also made the region - which includes Concord, Harrisburg, Kannapolis, Midland and Mount Pleasant - a major visitor destination with and impressive tourism sector that is a key component of the economy. From its choice location in the Charlotte, North Carolina metro, Cabarrus County is home to more than 196,762 residents. Its expanding roster of industry includes companies on the cutting edge of innovation. 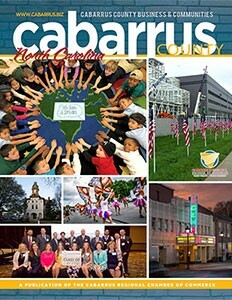 Click the magazine image to view the Cabarrus Resource Guide, a publication highlighting Cabarrus County. For a hard copy of our Cabarrus County area relocation packet, please visit our office Monday - Friday, 8:30 a.m. - 5 p.m. Banner photography courtesy of Carolina Portrait Designs.